It’s officially engraved: Bushwood is 2013 World Series champion. 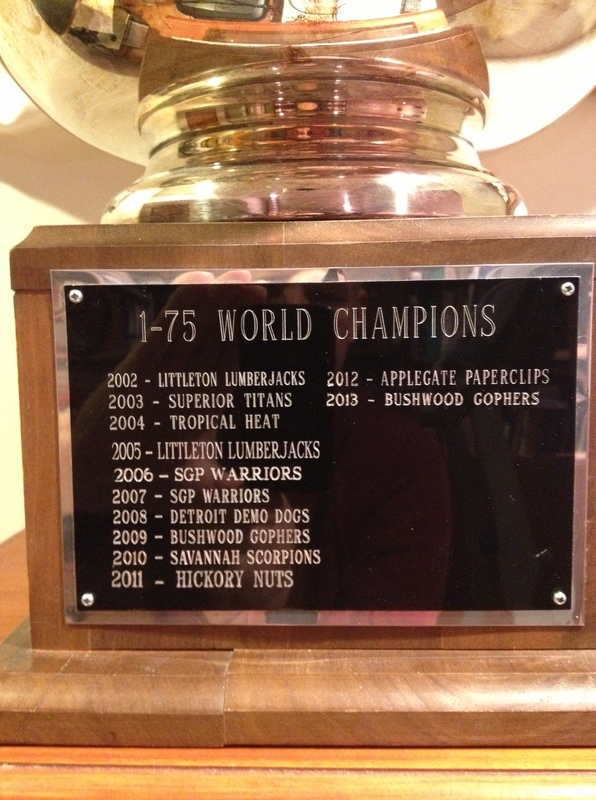 In a World Series that was so close that it took seven games and then three extra innings to decide, the Bushwood Gophers won a Game 7 for the ages by a 4-3 score over the Margaritaville Volcanoes to claim the club’s second I-75 Mail League championship in four years and sixth overall in the 34-year franchise history. After splitting the first six games that featured multiple lead changes, momentum swings and excitement galore, the two evenly matched clubs embarked on a Game 7 that will certainly go down as the most excruciating ever played in the long SOM careers of opposing managers Dave Renbarger and John McMillan. For the visiting Gophers, Game 7 ended in elation, when franchise player Albert Pujols doubled home Alex Rios from first base in the 12th inning with the winning run after Bushwood had executed several Houdini-like escapes throughout the late going. From innings 9 through 12, Margaritaville was one roll away from the title on nine different occasions with a runner in scoring position, but failed to bring him home all nine times. For the Volcanoes, playing in their third World Series in club history, it was the most bitter of all pills to swallow. In both of his previous Series trips, Doc Grid’s team lost in seven games (in 2007 vs. SGP and in 2011 vs. Hickory). This Game 7 loss, however, featured 16 runners left on base overall, including seven in the last four innings. From innings 9 through 12, Margaritaville was one roll away from the title on nine different occasions with a runner in scoring position, but failed to bring him home all nine times. One of those runners was cut down at the plate by an eyelash in the 11th. We pick up the action in the bottom of the ninth, with the Gophers, who plated three runs in the top of the first off Margaritaville starter Kyle Lohse,, clinging to a 3-2 lead, and closer Grant Balfour trying to lock down the victory for starter R.A. Dickey and the title for Bushwood fans across the globe in his final inning of usage for the Series. Pinch hitter deluxe Nolan Reimold singled to open the inning before John Jaso fanned. Dexter Fowler drew a walk before Joey Votto tied the score with a single. Now the Volcanoes have the winning run at third with one out, and the Gophers shift into survival mode. Jose Bautista rolls a 1-8 grounder to third that results in a fielder’s choice out at second with Fowler holding at third. A 5-5 walk to Brandon Moss loads the bases before Balfour reaches back to retire David Wright on a 5-8 flyout to extend the Series and exhaust his eligibility. In the top of the 10th, the Volcanoes’ fully stocked bullpen works around a one-out double by Pujols with no trouble. Having already blown through his five best relievers, Mgr. Renbarger must choose between lesser lights Jeremy Affeldt and Miguel Gonzalez for the most important innings of the season. He decides to go with Affeldt and close his eyes, with Justin Ruggiano due up to open the bottom of the 10th. The strategy works to perfection as the lefty retires the lefty masher on a 3-3 groundout. But Brandon Phillips followed with a double, putting the Gophers back into survival mode. The slugging Reimold is intentionally walked, and then the wheels start turning. Jesus Guzman pinch-hits for Jaso, Gonzo comes in to pitch, and Jonny Gomes enters to hit for Guzman. Gomes, a real-life Series hero for the Red Sox, fans on a 3-9 roll and Fowler flies out on a 1-10 to extend the Series again. After Kenley Jansen sets down the Gophers in order in the top of the 11th, Votto opens the bottom of the frame with a walk. Following a strikeout by Bautista, Brandon Moss rips a potential Series-ending double down the right field line. Votto wheels around third without breaking stride with a 1-12 shot to score. Bushwood RF Rios fires a strike to the plate, where Buster Posey braces for impact. A split roll of 12 comes up, meaning the play is so close it will be decided by Posey’s ability to block the plate, which is good, leaving Votto with safe odds of 1-6. The second split roll comes up a 10 to extend the Series again. With two outs and Moss on third, David Wright gets a free pass, and Ruggiano rolls a 4-11 2B-x chance. Veteran Gopher infielder Chase Utley makes the play to extend the Series again. Rios opened the 12th with a 4-6 walk off Jansen, who quickly retired Erick Aybar and John McDonald before Pujols’ double on a 2-6 roll broke the deadlock. But the Gophers still needed three more outs, and Gonzalez has no closer rating, thus must pitch in fatigue. Phillips led off with a pop out, but Reimold (you knew it would happen) followed with an endurance hit on a 6-7 roll that threatened to push Renbarger’s blood pressure off the charts. But Matt Wieters followed with tailor-made 6-4-3 DP on a 2-10 roll to end the Series and trigger a wild on-field celebration. Posey, who enjoyed a stellar Series, was named MVP. In addition to his game-saving play in the 11th, the slugging catcher hit .417 with 4 homers, 8 RBIs and 7 walks. David Ortiz (.393), Erick Aybar (.383) and Chris Carter (3 homers in 8 at-bats) also played huge roles for the Gophers. Carlos Gonzalez and Kris Medlen carried the torch for Margaritaville. CarGo hit a robust .522 for the Series. Medlen, the No. 2 overall pick in the March draft, vastly outpitched No. 3 pick Yu Darvish in a pair of head-to-head meetings, allowing just one earned run in 14 innings. Shockingly, the Volcanoes’ feared closing tandem of Aroldis Chapman and Kenley Jansen was Margaritaville’s undoing, combining for a 6.09 ERA and a whopping 6 homers allowed. The Gophers, trailing 5-4 with two outs and nobody on base in the top of the ninth, got back-to-back homers from Ortiz and Posey off Jansen to steal the victory in Game 1 on the road and set the tone for high drama and unexpected results that would continue through the Series. Medlen righted the Volcanoes’ ship quickly after the difficult Game 1 loss, allowing just 3 hits over 6 innings to even the Series. Chalk up another near-miraculous victory for the Gophers, who scored one in the ninth to tie it and two in the 10th to win it off the Volcanoes’ unraveling bullpen. The tying run came on an unlikely homer by Pablo Sandoval against Chapman with one out. Sandoval, a W-power guy against lefties, was almost lifted for a pinch-hitter before finding the homer on a 2-8 roll (1-13 odds, 4 roll). The winning runs came just as suddenly, when Posey followed Ortiz’s 2-out walk with a ballpark walkoff homer (1-12 odds, 11 roll). The Volcanoes again followed a demoralizing loss with a convincing win, this one authored by Josh Johnson, who was brilliant for six innings as Margaritaville evened the Series with its second four-hit shutout in three games. As everybody knows, when any best-of-7 series is tied after four games, the Game 5 winner almost always wins the thing. With this in mind, Bushwood starter Ryan Vogelsong quickly gave up a 5-spot in the third to hand the advantage to Margaritaville. But the Volcanoes sent it back to Bushwood in the sixth and seventh, when the Gophers used 3-run homers by Posey and Carter to take a seemingly safe 11-5 lead. But the never-say-die Volcanoes answered with a solo homer by CarGo in the eighth and a 3-run blast by Gomes in the ninth to pull to within two runs. With a runner on first, fatigued closer Balfour retired Phillips and dangerous PH Reimold to end the game and put the Gophers in control of the Series. In yet another incredibly tense, see-saw game featuring multiple potentially Series-ending rolls, the Volcanoes proved that they were also adept when shifting to survival mode. Naturally, with Medlen on the hill, the Gophers offense was stymied, but Kris only had 8 innings left and had to be removed in the ninth with a 4-2 lead. PH Chris Carter made it 4-3 by greeting reliever Charlie Furbush with a homer. This brought in Jansen, who immediately walked Posey on a 4-6 roll and surrendered a ballpark homer to Josh Hamilton (1-17 odds, 12 roll) to put the Gophers 3 outs away from the title. But Wright led off the bottom of the ninth with a scratch single off Balfour before disaster struck. New catcher Rob Brantly (a 4 defensively) had just entered the game because Posey (a 2 in the field) was removed for a pinch-runner the previous inning, and Brantly butchered a catch-x roll by CarGo to put runners and second and third with no outs. After Phillips was retired on a short fly for the first out, Elvis Andrus squeezed home the tying run to tie the game. With CarGo on third, Balfour retired the dangerous Jaso to extend the game once again. After an uneventful 10th, we had two more huge momentum swings in the 11th. Carter (him again) started the fun, greeting Chapman with a leadoff homer to again put the Gophers 3 outs away from the championship and the Volancoes back into survival mode. With the tiring Balfour still on the hill, Wright delivered a one-out double, but CarGo fanned to put the Gophers one out away. Up stepped Reimold, and the PH extraordinaire came through with a game-tying double to extend the Series and spark delirious cheers from the hometown Margaritaville crowd. Those cheers grew to deafening levels moments later when Andrus followed with another double to end Game 6. At the time, the opposing managers agreed that it was a game that would likely never be topped for sheer excitement and drama. And then we topped it with Game 7. Congrats once again Doc Grid and the snake-bitten Volcanoes for a thrilling and well-played Series.